The secrets of ocarina making revealed! Although ocarina making is simple in theory, there are numerous subtleties involved which general tutorials do not reveal. Like most new makers I battled with non sounding ocarinas, weak or absent high notes and complete disasters in surface finish. These difficulties almost lead me to give up. Starting from scratch it can take months before you make an ocarina which looks good and plays strongly through its entire range. 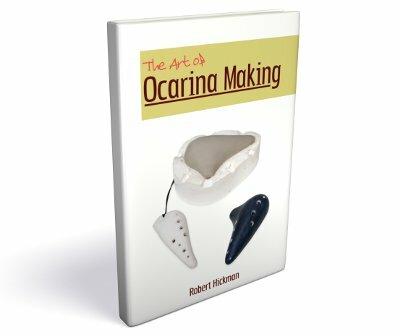 To give you a head start and save you from the tedium of avoidable mistakes, I have compiled my experiences into an E-Book, The Art Of Ocarina Making. whether you want to make ocarinas as a curiosity or a serious endeavour, The Art Of Ocarina Making details everything you need to know to make your first successful ocarinas. Each step is described in plain English accompanied with over 300 detailed photographs and diagrams. The book is in PDF format and is readable on any PDF supporting device including Windows/Mac/Linux, IOS, Android and Kindle 3+; A device with a large colour screen is preferable. The download link will be emailed to your PayPal email address. Robert Hickman has forever changed the online ocarina community with this book. We are a very small community and a good number of us eventually try our hand at making an ocarina at some point. Going forward, whenever anyone raises the question: "Hey, how does one go about learning to make an ocarina? ", and you can search the online forums and see that this question gets asked frequently, the answer will now be: "Well, first you need to get Hickman's book. What? You don't have it yet? Go buy the book, because any questions you ask before reading The Art of Ocarina Making are a waste of time." Read full review ». I have made it through Chapter I :The Basics, and may I just say that already, this is the most splendid guide to ocarina construction that I have ever had the pleasure of reading! I love that not only are there detailed instructions written in clear easy-to-follow English, but there are pictures illustrating every step of the process!!! Thank you so much for taking the time to write this! I look forward to reading the rest!!! I highly recommend that anyone interested in making ocarinas buy this - it is very thorough without being intimidating or daunting. Really well-written and plenty of pictures to provide visual examples. Thank you so much for being so generous. Really. The work is huge, the topics various, the book full of great pictures. Ocarina making sometimes seems to be a kept secret and it shouldn't be so. So thanks again for your huge investment for the Oc community. WOW. I'm about 3/4ths the way through and have learned SO MUCH. Can not wait for the weekend to start so I can start applying this to the mold I've already made. Definitely, *definitely* worth buying!